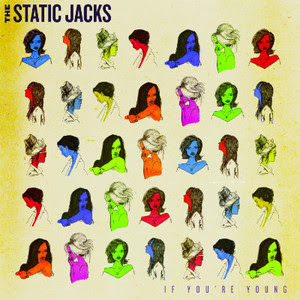 New Jersey The Static Jacks released their debut album, 'If You're Young' in the UK this week following its US release last year. I popped down to Brixton Academy the other week to check the band out supporting The Wombats, a band much maligned despite being quite inoffensive. The Static Jacks offered a spirited rambunction which pleased the terrifyingly pre-pubescent crowd and you can listen to a couple such tracks off the record below. The tracks below also appeared on their debut UK single, released by the good folks at Laissez Faire Club, of which my preference is b-side 'Mercy, Hallelujah'. Ignore the dubious 'Songs Of Praise' title that initially put me off. It's a track undoubtedly indebted to The Cure but all the better for it. The a-side to that LFC release is 'Into The Sun', a jumpy anthem which certainly impressed fans of The Wombats. For me, it swims along pleasantly but really jumps out between 1.58 and 2.23, building on a triumphant guitar solo. More triumphant guitar solos in future please. But it's actually an older track, which doesn't appear on the album, that is my favourite of theirs - the multi-layered 'Who Are The Replacements'. Listen to all the tracks below. 'If You're Young' is available to purchase at Amazon.co.uk etc. Find more info at thestaticjacks.com.